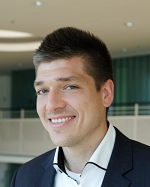 Short biography: Dr. Max Hoffmann is a scientific researcher with the Institute of Information Management in Mechanical Engineering at the RWTH Aachen University since 2012. In the years from 2012 to 2017 he focused on the consulting of various industrial partners as part of the research group “Production Technology” as well as on his Ph.D. thesis (Dr.-Ing.). Since 2016, Max Hoffmann is Research Group Leader of the “Industrial Big Data” group, which focuses on the requirement of modern manufacturing with regard to the digitization. Prior to his engagement with the institute Max Hoffmann has studied Mechanical Engineering with emphasis on Process Engineering at the RWTH Aachen University until 2010. Parallel to his first consultancy activities in IT he acquired an additional degree in general economic science in 2012 by achieving a Master of Business Administration (MBA). In the context of his doctorate activities as well as in terms of his current research, Max Hoffmann is focusing on topics related to the digitization in the manufacturing industries. The covers the information technological process chain from the acquisition of data in the field by making use of semantic interface and IoT technologies (OPC UA, MQTT, …), the integration of information using highly scalable technologies (Big Data) as well as the creation of valuable insights for the production process by means of data-driven approaches (Machine Learning). A distinctive focus of the Industrial Big Data group hereby consists in the research novel concepts for processing and storage of huge data sets by making use of “Data Lake” approaches. These concepts allow for a holistic usage of data from the field together with information from higher systems of production planning and control (ERP, MES, …). Current research activities of Max Hoffmann besides topics related to the “Industrial Big Data” also cover fields such as semantic technologies, ontologies and the application of (Industrial) Internet of Things technologies in the production context. Additional research activities focus on multi-agent system technologies in manufacturing. In this context, Max Hoffmann is part of the expert group “Agent systems in automation technology”, member of the technical committee “Agent systems” of the VDI/VDE-Gesellschaft Mess- und Automatisierungstechnik (GMA) as well as author of the standard of the working group.